An airbag inflator is a device which fills airbag cushions with gas during a car crash. They exist everywhere there is an airbag in your vehicle, and are an essential component of automotive safety. In order to work, they must release a precise amount of gas during a car accident in order to inflate the airbag cushion. Therefore, it is critical that these devices maintain a certain pressure of gas over the course of their lifetime. In order to ensure that an airbag inflator will maintain the correct gas pressure to inflate airbag cushions over the course of their lifetime, they must be leak tested before being delivered to car manufacturers. The leak rate specification is typically quite small so helium hard vacuum leak testing is often the preferred method of choice. This method allows for leak detection down to 1 x 10-9 atmcc/sec. Leaks in the test part can be measured inside-out or outside-in. For inside-out leak detection, the test part is either filled and sealed with helium inside, bombed with helium after it is sealed, or temporarily pressurized with helium during the test. The part is placed in a vacuum chamber and the chamber is evacuated. For outside-in leak detection, the test part is evacuated and helium is sprayed on the outside of the part. The helium leaking from the part is sampled through the vacuum line by the helium mass spectrometer leak detector. An automotive parts manufacturer recently came to LACO needing a way to leak test some of their automotive safety components, specifically their airbag inflators. They required a quick leak testing solution for low volume production which made LACO’s TitanTest Helium Leak Detector the perfect instrument to leak test their inflators. 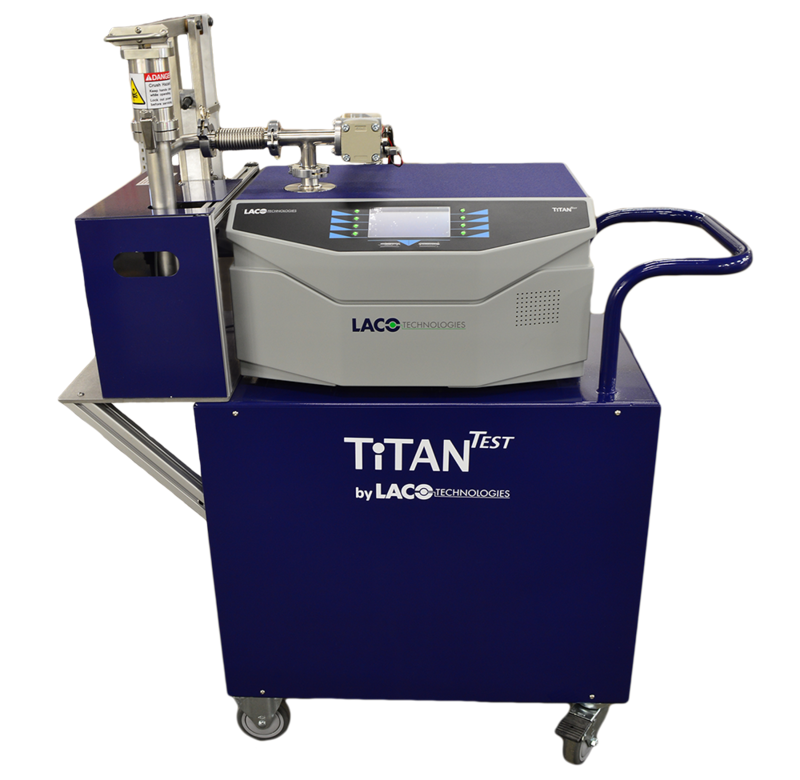 LACO supplied the airbag inflator manufacturer with a TitanTest™ Helium Leak Detector mounted on a cart for easy transportation. The cart was also used to house a 28 CFM external rotary vane vacuum pump for increased roughing capacity and pumping speed. The manufacturer also needed a quick way to leak test the airbag inflators so we provided them with a custom designed vertical loading high vacuum leak test chamber mounted next to the leak detector. – Two sections with a bottom part (for accommodating two inflator models and an upper section (counter balanced) to seal the test chamber. – Equipped with a sensor to detect when lid is closed for automatic test cycle start. – Vacuum chamber lid counter balanced with automatic opening at the end of the test cycle. – Helium leak tested at 1E-8 Atm.cc/sec. 1) The operator loads a part into the test chamber. 2) Operator closes the lid. 3) As soon as lid closes, sensor detects closed lid, the cycle starts automatically. 4) Large 28 CFM roughing pump (W2V80) pulls vacuum in the test chamber. ∙ Gross leak test based on pump down time. ∙ Fine leak test (1E-8 atm.cc/sec threshold). 6) At the end of the test the leak detector shows the test results, Pass or Fail, the chamber automatically vents back to atmosphere. 7) The test chamber lid pop-opens automatically, fully clearing the opening of the test chamber, giving the operator easy access to the inflator. 8) Operator unloads the part and repeats step (1). Automotive manufacturers are using the latest leak testing technology in order to increase vehicle safety for people all around the world. 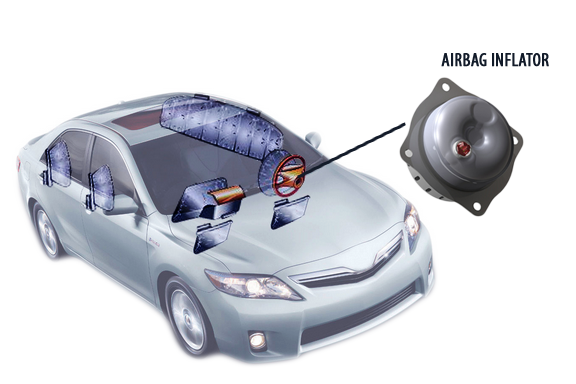 Helium leak detection offers the greatest amount of sensitivity so manufacturers can find smaller leaks in their parts and improve upon the quality, thus making our cars much safer to drive.